For almost two decades, the indie-pop act Belle & Sebastian has written wistful bedroom anthems for the wallflowers — the last ones you’d expect to be on the homecoming dance floor. Thus, it was a slight surprise for longtime followers when Belle & Sebastian released their new album in January, “Girls in Peacetime Want to Dance.” And April 12, the Scottish ensemble’s performance at the Greek Theater captured a newfound grooviness and sparkling showmanship, reflecting the rhythmic themes of their latest work. 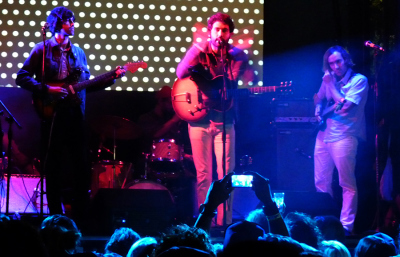 Belle & Sebastian’s headlining performance was preceded by two opening acts — Perfume Genius and Real Estate. Perfume Genius started the three-part concert with its signature blend of new wave synths and more abrasive, industrial rhythms, peppered with several acoustic piano performances. The soulful flamboyance of his delivery and the topics of sexuality in his lyricism might conjure comparisons to Ziggy Stardust. The evening then cooled down as Real Estate took the stage. The guitar-centric quartet built lush, breezy soundscapes through jangly chords and delicate arpeggios — hallmarks of their surf-rock sound. After Real Estate’s performance, a vintage model appeared on screen, stylized with the glamorous hairdo and deep lipstick that recalls retro propaganda posters. The woman introduced the band and its large group of backup dancers — lucky volunteers from the audience. 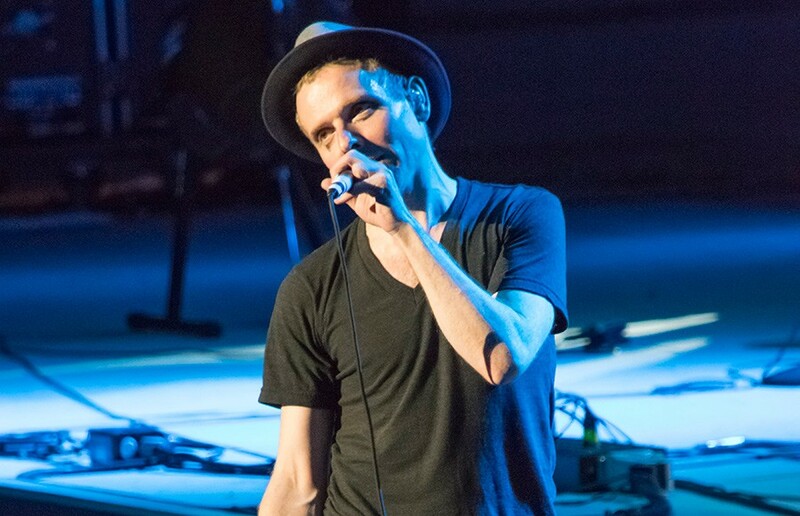 Frontman Stuart Murdoch finally stepped onto the stage with his mousy charm. The star of the group, the lead singer demonstrated an ironic confidence in his shy affectations — softly setting down his fedora, giving a sly shrug to the audience. Swoon! Yet Belle & Sebastian’s performance felt too polished at times. Perhaps the gloss naturally comes with experience, or perhaps the band hoped to compensate for middle age with a little more pep. The band started their set with “No Empire,” the opening track off their new album. With bouncing piano chords, baroque flourishes and sly lyrical contradictions such as “you’re a quiet revolution,” the album version is standard fare for the group’s signature twee. But Murdoch’s performance swapped the song’s sunshine for the heaviness of a ballad. Huge, grainy snapshots of the Great Depression loomed in the background. Strangely enough, these images of strife took the grit out of “Nobody’s Empire,” as the band’s emphasis on emotional gravity lost the awkward youth that has been their endearing signature. For any band with an extensive discography, touring with new material can be tough when the audience is eager for the classics. When Belle & Sebastian followed “Nobody’s Empire” with the familiar, electrifying riffs of “I’m a Cuckoo,” the crowd erupted in celebration. 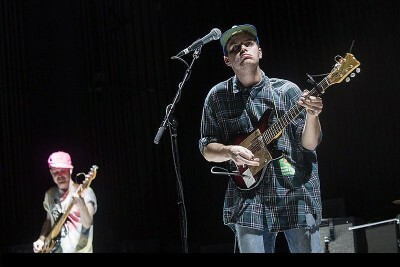 The band seemed self-aware of this tug-and-pull between old and new, often trading off between fresh material and hits such as “The Stars of Track and Field.” In fact, the group ditched their elaborate visuals for their most popular songs, confident that the energy of these hits could carry the performance. The band’s experimentation with dance-oriented sounds was evident in “The Party Line.” The song combined a funky bass, a surprise keytar and the smoky, modish cool of The Zombies. A later song, “Perfect Couples,” incorporated the worldly rhythms of the bongos. Toward the end of the set, Murdoch asked for a “smattering” of the audience to join them on stage for a performance of the “The Boy with the Arab Strap.” Eager fans climbed up, and dozens of strangers jived together with a certain, united naivete. The motions on stage were right at home in a Charlie Brown musical. At times, the dancing was blissful, but at other times it felt cartoonish. There was a key choice for the audience — be irked by the affectations or dissolve your adult cynicism to join the fun. To breed camaraderie with his Bay Area fans, Murdoch demonstrated a familiarity with San Francisco, mentioning neighborhoods such as the Mission District and Potrero Hill. In fact, he let us know that the Sukie of “Sukie in the Graveyard” is a San Francisco native. Despite the gimmicky moments of his showmanship, Murdoch won the crowd with his charming yet sentimental pop. If you feel right at home in San Francisco, Murdoch, then that’s all the better. You’re welcome back anytime.